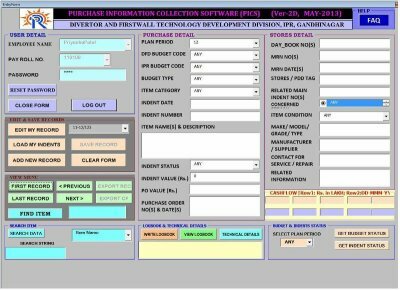 PURCHASE INFORMATION COLLECTION SOFTWARE (PICS) - development is an Initiative to facilitate members of High Temperature Technologies Division (HTTD) of IPR with centralized Storage, retrieval and sharing of information related to various items indented/purchased. PICS is intended to be very simple in nature with no special software requirements but capable of Providing quick and efficient way for handling information related to indented/purchased Items such as purchase/stores details, vendor details, technical details, etc. A user form with Command buttons, input text fields, labels and combo-boxes is written in Visual Basic Language. It provides a single window interface for storage and retrieval of information from MS-EXCEL Workbooks stored on a desktop computer connected to IPR intranet serving as a Centralized database server. PICS is based on Microsoft products i.e. Visual Basic and MS-EXCEL, Hence its use is limited to the networked computers operating with MS-Windows Operating system. The user form interface has been kept simple and self-explanatory. Attempt has also been made to secure the software against possible mistakes. The software is not linked with any other database server for automated update of information and hence it needs Manual entry of the data in respective fields by the user. Thus, "PICS" software provides Information related to indented items in all respects varying from commercial to technical Details needed by members of DFD.